Between the ages of five and fifteen, I was a serious student of Bharatanatyam, a classical dance form from South India that was originally performed in temples as worship. When I danced as a child, I often wore ghoongaroos—bells on my ankles—and I loved the sound they made as they kept the rhythm of the movement. As I got older, Bharatanatyam came to be an extension of the Siddha Yoga practices that I engaged in at home with my family and at the Siddha Yoga Meditation Center of Vancouver. During those years I felt great devotion and connection with the inner Self when I danced. As I made the steps and movements, I would visualize offering them to Gurumayi. At these times, I felt very close to God, to the Guru, and to my own heart. When I completed my dance training, I turned my focus toward academic subjects and eventually studied at university to become a software engineer. Although I continued to dance on occasion, Bharatanatyam was no longer the center of my life. After graduating from university, in the summer of 2013, I was able to fulfill a longing that I had held since I was a child: to serve Gurumayi’s mission by supporting the work of the SYDA Foundation. 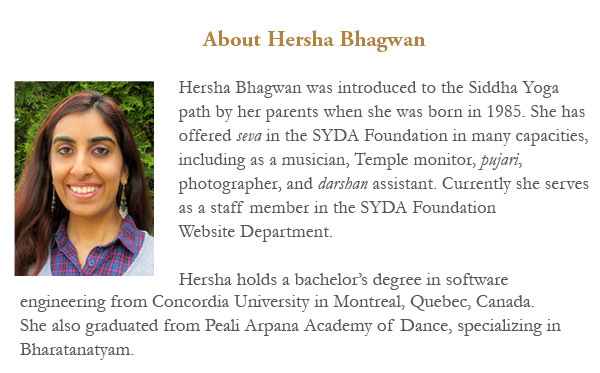 I began to offer seva full-time in the SYDA Foundation Website Department. After arriving at Shree Muktananda Ashram, whenever I had the opportunity I would offer dance namaskar to the Shiva Nataraj, the statue of dancing Shiva that stands at the entrance to the Anugraha building. In dance namaskar the dancer seeks permission and blessings from the earth on which they dance and offers their dance to the chosen deity. At such moments I felt deep longing for the experience of divinity within, the feeling I experienced when I danced Bharatanatyam as a child. It was as if I was having an inner conversation with Gurumayi, telling her of my yearning to have those experiences again. One morning in August, I saw Gurumayi standing in Nidhi Chauk, on her way into the satsang hall, Shri Nilaya. She was talking with a small group of visiting sevites. As I moved forward to greet her, Gurumayi gave me a big smile as if to say, “Ah, there you are. I’ve been looking for you.” She reached into her pocket and held out a pair of ankle bracelets. “You wear anklets, don’t you?” she asked. Gurumayi placed the anklets in my hands. They were silver with three small bells on each anklet; I bent down to put them on right away. With the sound of those bells tinkling on my ankles, I was inspired to dance again. I made time in my schedule to practice the intricate steps and movements of Bharatanatyam. The connection with my heart that I used to experience through dance was re-kindled. The following June, I was invited to join a group of dancers to offer seva for Birthday Bliss—Anukampa, the celebration in honor of Gurumayi’s birthday. One day, while we were preparing for the celebration, Gurumayi came to the lawn near the Ganesh statue at Anugraha where we were rehearsing. Gurumayi said to me, “You know Bharatanatyam. Show us.” I started to dance a fast, technical, rhythmic step. Instantly Gurumayi motioned me to stop and said gently, “More pose-like,” which in the vocabulary of Bharatanatyam means “something more devotional.” In that moment I remembered a prayer to Lord Ganesha that I used to dance, and I began to narrate it through my movements. As I danced before Gurumayi, the movements flowed through me effortlessly. I felt I was making an offering to her with my whole being—just as I had imagined so many times in my childhood. 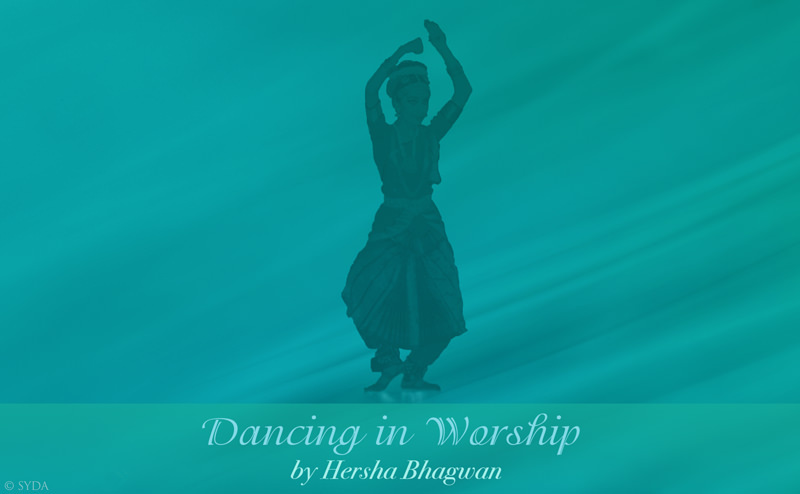 I was back in the free space of pure offering and completely absorbed in the bliss of worship through dance. Later I offered the same dance before the statue of Lord Ganesha as part of the second video chapter of Birthday Bliss—Anukampa. Many people shared that when they saw the dance on the website, they felt that an act of worship was being performed on their behalf. Since Gurumayi gave me the anklets I have worn them all the time. The anklets remind me, whatever I am doing, to come from my heart. Just as when I dance and become absorbed in the present moment, I can perform all my actions as pure offering. With this stance, I can live in connection with the ecstatic, worshipful space within. I am so grateful to Gurumayi for reconnecting me to the power of worshipful dance that puts me in touch with the bliss of my own Self. When I was reading this reflection, my heart filled with gratitude to Gurumayi. As a Bharatnatyam dancer, I understood the feeling of offering my art to my Guru. Naturally, I want to show the best of what I have learned, and while doing that I realize my capabilities. While reading this reflection, I understood that whether it be in dance or in daily life, when I seek Gurumayi’s blessings, grace is there. Reading this share about the writer’s connection to God, to the Guru, and to her own heart when she danced as a child brought me back to a feeling I had as a child when I spent time in nature. As I got older, I, too, in the midst of studies and beginning a career, lost touch with something important that had brought me such a sense of connectedness and joy. So I was very moved to read of her longing to experience the divinity she had known as a child through dance, and to hear about her sense of having an inner conversation with Gurumayi as she offered dance namaskar to Shiva Nataraj. Gurumayi’s generous response to this longing reminds me of the deep inner connection that Gurumayi has with each of us. This highlights for me how the Guru knows our heart’s true longing and bestows her grace, how she supports each of us to experience God within in ways that are most natural to us.